2. Write the name of the woman or girl whose story has inspired you and take a photo holding your sign. 3. 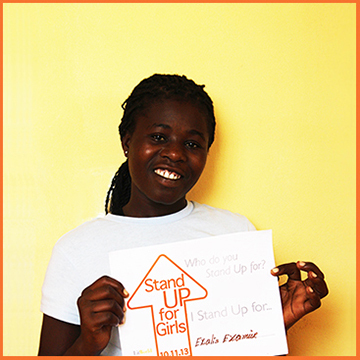 Post the picture on your social media sites and to the LitWorld Facebook page to tell the world who you are standing up for using the hashtag #standup4girls. 4. Spread the movement even wider by inviting your friends, family and followers to take a photo with their own sign. 5. Stand Up at 12 o'clock on the International Day of the Girl! When you rise on 10.11.13 you'll be standing up with thousands of other girls, boys, women and men around the world. Newer PostWhose Story Will You Stand Up For on 10.11.13?